Chances are, you 'know' a few things about food and nutrition that are actually not true. These food myths enter quietly into our collective common knowledge and spread disinformation with ease. 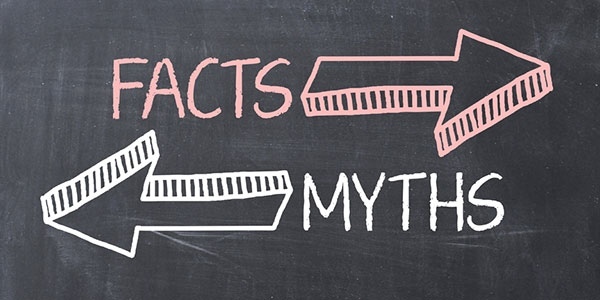 Our experts bust 5 of the top nutrition myths below. Chocolate causes acne. Eating crust makes your hair curly. You shouldn't eat before swimming. These are but a few food myths that may have spooked you as a child but which you now probably know to be entirely false. However, many other nutrition myths that remain ingrained in our imaginations will persist in current discourse and continue to misinform our diets until we learn the cold, hard truth about their legitimacy. Here are five mainstream nutrition myths that you can rest easy have been debunked by modern science. Nighttime Eating Causes Weight Gain. This nutrition myth supposes that late-night eating makes you more likely to pack on pounds than does daytime eating - a food myth further propagated by diets that prescribe tapering off calorie intake throughout the day by eating a large breakfast and a minuscule dinner. However, according to the U.S. Department of Agriculture, weight gain, loss, or maintenance is influenced not by what time you eat, but by what foods you eat and your physical activity levels. Sodium Restriction Only Applies if You Have High Blood Pressure. Of the numerous nutrition myths about sodium intake, one of the most prevailing is that sodium restriction is only a concern for those with high blood pressure - meaning you don't have to worry about sodium if you have a healthy blood pressure. However, according to the American Heart Association, even if you don't have high blood pressure, you should strive for a recommended sodium intake of less than 1500 mg daily. Eggs Are Bad for the Heart. Because of their substantial cholesterol content - about 211 mg in a single, large egg - eggs have been the unfortunate victim of a long-held food myth that they are heart-unhealthy. But you don't have to give up on your favorite omelets because according to the American Heart Association, healthy individuals should be able to eat one egg per day without issue. It is recommended that people with heart problems or diabetes drop down to two eggs per week. Brown Sugar is Healthier Than White Sugar. Individuals with a sweet tooth may justify their sugar intake with the nutrition myth that brown sugar is better than its white counterpart, but the bitter truth is that brown sugar is white sugar, but with the addition of molasses. According to the University of Washington School of Medicine, the minuscule mineral content in brown sugar is not enough to confer nutritive value in the amounts that sugar is generally consumed. Nuts are Bad Because They are Fattening. In their quest to cut calories, numerous dieters shun nuts due to the often perpetuated food myth that nuts should be avoided due to their high-fat content. However, the University of Washington School of Medicine encourages eating nuts in moderation, as there is a distinction between bad fats and the good monounsaturated and polyunsaturated fats and plant sterols in nuts. The good fats in nuts have even been shown to lower LDL or "bad" cholesterol.